Playtech continue with the development of online slot games based on all time classic films. The 1970s classic grease is the latest to be delivered and it offers fun game play and a host of bonus features. This is a new video slot machine released by Playtech into all the good UK online casinos. The game is bright and colourful and features all the main characters from the well loved film from 1978. Follow Danny and Sandy around 1950s Rydell High School and win some great cash as the bonus slots pay out with free spins. Standard symbols of J, Q, K and A are mixed with characters and symbols from the film. You will also see WILD and BONUS symbols. The game is easy to play, choose the coin size and the amount to bet. There are 20 paylines that can give you a win. Spin the reels and get a win for matching symbols on active paylines from left to right. Fully stacked symbols are available as Danny, Sandy or both main characters together. Getting one of these fully stacked sybols on reel 1 triggers the first bonus game, the "rockin' and rollin' respins". 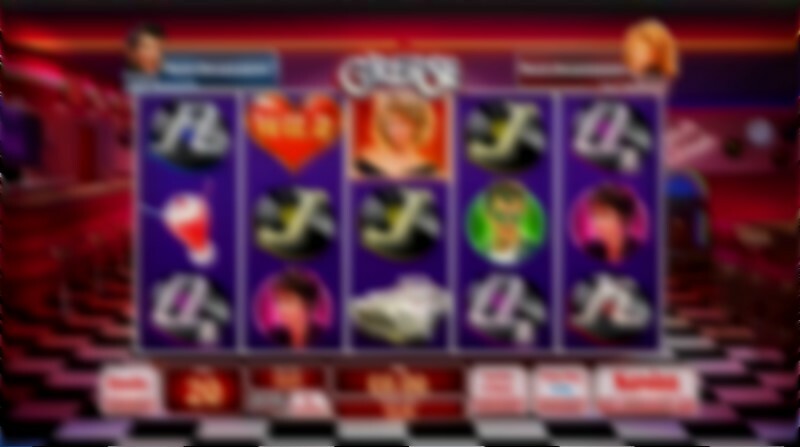 This gives three free respins with all Danny, Sandy and Wild symbols held in place. This can give a big win as all added Danny, Sandy and Wilds are also held in place for the duration of the respins.